Discussions about whether schools for children should start later have been making headlines recently, highlighting the importance of getting enough sleep at night. We all know how important sleep is for day-to-day performance—you’ve likely experienced firsthand how hard it can be to think and focus after a bad night’s sleep. Luckily, these effects are reversible: just get enough sleep for the next couple of nights and you’ll feel refreshed again. But can sleep deprivation have long-term, irreversible consequences in children? Across multiple species, young animals need more sleep than adults. Although the purpose of sleep is not fully understood, researchers believe that the brain may use this time to repair itself, store new memories, and modify itself to stay current with recently learned skills or adapt to changes in the environment (a process known as plasticity). The brains of young animals are very plastic and are undergoing a lot of changes as they develop, and scientists have always suspected that increased sleep is necessary for normal brain development. In humans, the majority of brain growth occurs before the age of two, which is also the period of life with the highest amount of sleep. In a recent paper published in Science, the Sehgal lab studied the link between sleep and brain development using Drosophila melanogaster and found that loss of sleep in immature flies led to abnormal development in a fast-growing area of the brain and consequent behavioral problems in adult flies. Just like humans and other mammals, fruit flies need a good night’s sleep to function normally during the day. The authors began their study by confirming that in flies, young animals also sleep more than adults. They then sleep deprived a group of flies by placing them in a shaking machine for two nights and measured their behavior three days later (a long time for a humble fruit fly!). Fly researchers prefer to study innate behaviors because they are instinctual instead of learned, suggesting that their underlying brain structure develops genetically rather than from experience (in these cases, it is thought that the “nature versus nurture scale” is tipped toward nature.) In this case, the authors studied “courtship behavior”, a measure of how well male flies can solicit female flies and successfully pass on his genes (so to speak). They found that flies that were sleep deprived when they were younger didn’t perform as well as flies that had gotten enough sleep. 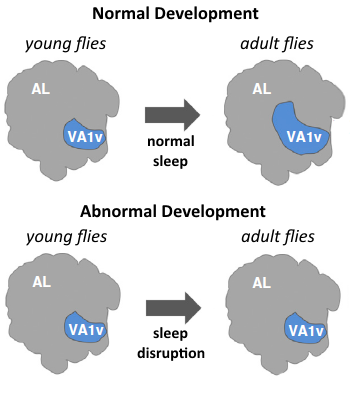 The authors showed that this behavioral abnormality was specifically caused by loss of sleep in young flies, because flies that were sleep deprived as adults performed normally three days later. Figure 1. Sleep is required in young flies for normal development of fast-growing brain regions. Sleep deprivation during youth causes lack of growth in the VA1v, an important region for courtship behavior. Image modified from Murakami and Keene, 2014. What happened in the brains of young sleep-deprived flies that led to their courtship inadequacy as adults? Previous research had already located the brain regions responsible for this innate behavior, so the authors knew where to start looking. They found that one of the regions (a structure called the VA1v) had not grown as much in flies that had been sleep-deprived when they were young. The VA1v is a very fast-growing region during development, and the authors showed that loss of sleep irreversibly slowed its growth. On the other hand, structures that do not undergo fast growth during development were normal. The authors concluded that sleep deprivation in young animals impairs brain development in fast-growing areas, resulting in irreversible behavioral abnormalities. These results demonstrate just how important it can be to get enough sleep, especially as children. Research with human children already indicate that loss of sleep can have long-term effects on behavior, and the findings from this paper suggest that the consequences may not always be reversible if developing regions of the brain are affected. But what if children have a developmental or genetic disorder—such as a pediatric sleep disorder—that causes loss of sleep during this critical time period? The authors also figured out the difference in young fly brains that caused them to sleep more than adults. Using the impressive set of genetic tools that Drosophila are famous for, they identified a small set of dopaminergic (DA) cells that behaved differently in young versus adult flies. Dopamine is a chemical in the brain that some neurons use to communicate with each other, and is already known to be important for the “be awake!” signal in several mammalian species and humans. The authors found that this particular set of DA neurons was less active in young flies than adults, while other DA neurons had the same activity level regardless of age. The neurons communicated with a sleep-related structure known as the dorsal fan-shaped body (dFSB). The authors found that in young flies, reduced activity in these DA neurons allowed the dFSB to be more active, causing the flies to sleep more. When the authors artificially activated the DA neurons, they found that young flies were unable to sleep and had behavioral problems three days later, while adult flies did not experience any long-term effects. This result matched the one they obtained when they sleep deprived young flies by shaking them, confirming that reduced activity in these neurons was responsible for the extra sleep in young flies. How can knowing the circuit responsible for extra sleep in young flies help us humans? Dopamine plays the same role in causing wakefulness in mammals as it does in flies, and the dFSB is similar to known mammalian sleep-related structures (such as the VLPO). Researchers can use these findings as a starting point for identifying similar DA neurons in mammals. Eventually, scientists may be able to develop a treatment that acts on these neurons in children with sleep disorders, allowing them to get more sleep and ensure normal brain development during this critical period. Figure 2. The circuit responsible for extra sleep in young flies. In young flies, a set of dopaminergic (DA) neurons is less active, allowing a sleep-related structure known as the dFSB to be more active and promote extra sleep. In adult flies, the DA neurons are more active and suppress dFSB activity, leading to relatively less sleep.